Greater minds than the average Joe have lauded the guitar playing skills of Katie Spencer, but you do not need to ascend to aficionado status to know that you are listening to something special. This applies to seeing her play live on an increasing number of dates that are beginning to grow as her star shines brighter on the folk and acoustic network, or at least listening on record. The latter is set to take off in new directions with the release of a debut full-Length album. WEATHER BEATEN is just the fillip Katie Spencer needs to broaden a horizon that is starting to branch out more from her Humberside base. 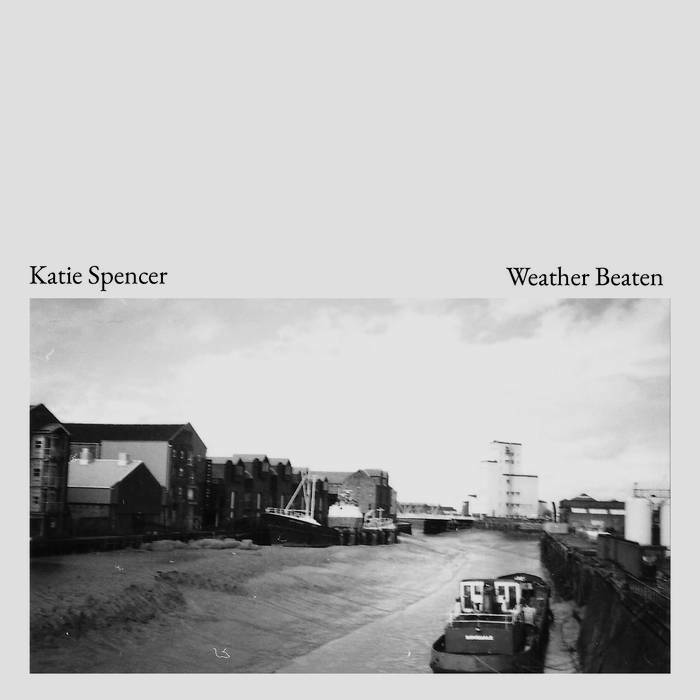 Previously, there was the GOOD MORNING SKY EP which started to open doors for Katie with its five tracks leaving the desired effect of the listener wanting more. Now the output has doubled, the promise moves a lot further down the road to fulfillment. From start to finish, the 38-minute playing time takes the listener on a mesmerising journey, while encapsulating them in a chilled out evocative zone. Choose the listening mode at your leisure, as this album gains traction whether you are on your daily commute or find a relaxing few moments when the rest of life can park up. 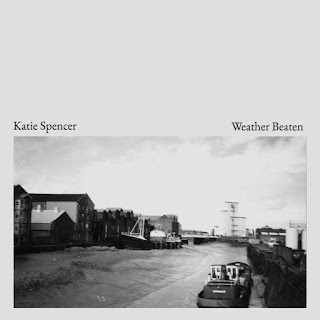 Katie Spencer largely comes across as a lone operator as this spills out from the ten tracks. Nine have their writing and arrangement credited to Katie on her own, with the tenth a solely arranged traditional song. The latter appears to be a local tale titled ‘Spencer the Rover’, mainly deduced from Yorkshire references in the words and not any family connection. There are three other musicians credited with working on the album, with the most prominent of these being occasional flute and clarinet interludes to break up the incessant, yet compulsive guitar input. For those who like to absorb their minds in song lyrics, the musings of Katie will prompt many strands of head scratching thought. Extremely metaphorical and frequently pure poetry, interpretations to the listener can be quite abstract, but without doubt, inspirations and meaning will likely surface in the live setting. Some tracks are quite minimalist in their whole presentation such as opening number ‘Incense Skin’, while the most profound message found in her writing exists in ‘You Came Like a Hurricane’. This song has featured in her sets for a while and probably ranks alongside ‘Hello Sun’ as the two songs to spearhead the album, although this record is not necessarily a contest to pitch tracks ahead of one another. Either way, analysis of light and dark in the latter makes this personifying tilt an intriguing listen. After many plays a light bulb moment occurred during album closer ‘The Hunter’, with serious thoughts turning to how much of this record sounds like Laura Marling at her transfixing best. Moody vocals blending with deft guitar playing resulting in a haunting mellowed haze easing from art creator to art receiver with very little in between. The baton of Katie Spencer’s WEATHER BEATEN now passes to you. Where do you start with Emily Barker? Back in 2009 at an Electric Dustbowl 2 Americana evening in Leicester is one place on a personal front. From that multiple act event at The Musician and onwards over the subsequent decade, this exiled Aussie has barely drawn breath on the UK music scene and there is no sign of letting up. On the back of Red Clay Halo shows, other full band ones, collaboration with pop-up acts like Vena Portae and Applewood Road, and duos with Lukas Drinkwater, a solo one seen can join the list and a rather splendid one to boot. 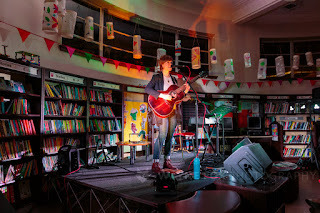 This was her first visit to Thimblemill Library in the West Midlands, in fact an impromptu show as the team behind these Thimblemill Events responded to a social media call to host a few of what were technically warm up dates. The warm up is ahead of a brand new Emily Barker album that is starting to take shape in the form of several new songs moving into prototype status. The opportunity to road test five of these proved a valuable exercise, but you know this is not an artist to deal in short measures and those venturing down the library on a Sunday night had the full 80-minute Emily Barker experience. Before you say, is not Emily releasing an album due out with Marry Waterson at the end of March? The answer is yes, but details on that remained a little sketchy during the evening. The focus was entirely on the solo work and evidence surfacing during the show looked like Emily drifting back into serious ballad mode after her soulful jaunt down Memphis way for the award winning SWEET KIND OF BLUE album. Switching between acoustic guitar and and keyboards, Emily tended to major on the former including trialling all five new numbers, which at least four were titled with one literally only days old. Opening with one of the newbies ‘Geography’ seemed an apt title in a library setting, a theory compounded later when she introduced ‘Ordinary’ as another song inspired by Aussie author Tim Winter. We later learned that his work was also the inspiration for one of her older songs ‘Disappear’. ‘Dinosaur Bones’ and ‘Leave a Light on by the Side of the Door’ were two other new songs to seep out, with the temporarily named ‘Returning’ acting as the song with the ink still wet. Emily repeatedly stated that these were work-in-progress, but having experienced their burgeoning quality, the finished products will mean the old Emily Barker classics may need to shuffle along to make space. Of course, not everybody is acquainted with the back catalogue, so a top sell occurred for the SWEET KIND OF BLUE album via a detailed recount of the experience and excellent versions of ‘Sister Goodbye’, ‘Over My Shoulder’ and one of a pair of standout out moments on the night, a version of ‘No. 5 Hurricane’. The other highlight was a divine rendition of ‘In the Winter I Returned’, from my favourite Emily Barker album DEAR RIVER. Alongside a gorgeous voice, deft playing and an engaging charm in sharing her thoughts with an audience, Emily did indulge in one cover and few complained when she gave a sweetened gloss to Springsteen’s ‘Tougher Than the Rest’. Like all of her gigs, you do not need to be a long-term fan to get something out of it, but one certainty is that any room is likely to empty with a raft of new fans. Opening the show this evening was Birmingham singer-songwriter Michael King, making a rare solo appearance away from his regular music role of fronting the band Boat to Row. He too used the opportunity to share some new tunes, which are likely to appear on the band’s upcoming album once entangled from the funding mess instigated by Pledge’s mismanagement. Michael embraced the opportunity to share a few songs in this format and will benefit from further exposure as he forges ahead with the band’s latest project. Long term Emily Barker fans know that there is often something new round the corner and this shows no sign of abating. Nights like this demonstrate what a dedicated and fan-focussed artist she is and whether you joined her bandwagon in 2009 or 2019, the treat is all on the listener. 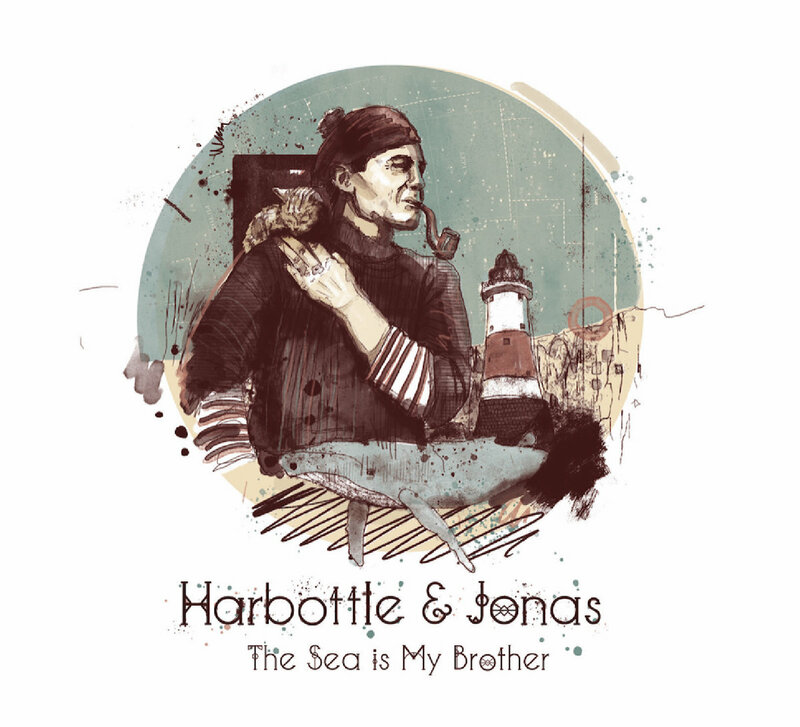 Artistic duality threads right through the latest album from Devon-based folk duo Harbottle & Jonas. Starting with the individual attributes of husband and wife team David Harbottle and Freya Jonas, the art of storytelling pairs off into the worlds of new writing and traditional arrangements to form a body of work not too short of heavyweight status. THE SEA IS MY BROTHER takes an obvious lead from the nautical world and unveils eleven tracks spanning the shoreline of our land spinning tales of contrasting ages, outcomes and inspirations. Whether heading in the direction of triumph or tragedy, the blending of golden ingredients ensures the finished product is ripe for listener engagement and satisfaction. Eight of the eleven tracks are written by either Harbottle or Jonas, one of these ‘Elizabeth Prettejohn’ being the sole instrumental on the album. From history, you know that songs on certain topics are not going to end well such as ‘Fr. Thomas Byles’ (Titanic) and ‘Lost to the Sea’ (Morecambe Bay cockle pickers). On the other hand, ‘A Lady Awake’ (another contemporary tribute to the 'angle of the north', Grace Darling) and ‘Headscarf Revolutionaries’ (a successful campaign to raise standards in the fishing industry), pose as upbeat pieces of good news, ensuring that successful stories, whether new or old, are continually written in song for future generations to enjoy. Whatever direction Harbottle and Jones take their work in, the content, approach and output adds to a fascinating mix. While there are certain demands put upon the listener, rewards for hard-yards applied are endless. If delving deep into a folk album, admiring two contrasting voices and losing yourself in a whirlwind of harmonium, concertina and various stringed instruments is considered a treat, then this album is heading in your direction. Without soaring up to enormous highs (consistency is a valid trait), there are several significant moments to pinpoint facets of the album. The opening track, a non-Harbottle and Jonas write based on the Scott/Amundsen race to the South Pole (the sole land based leaning offering) ‘Was It You’ has probably the strongest chorus on the album and generally smooths the way for the sterner material. ‘Liverpool City’ sees the duo slip into sentimental mode with a song based on the location of their meeting to provide a diversion from the generally tougher content on the record. The search for the vocal high is likely to end with Jonas' gorgeous wrap around the title track ‘The Sea is My Brother’. In addition, no folk album is complete without a spritely traditional number to fuel the purists and ‘The Saucy Sailor Boys’ fits the bill. The final two tracks to complete this brief round-up are an upbeat arrangement to a poem called ‘Hall Sands’ and the closing song, ‘Saved Alone’ written by Jonas. These are another two to put into the tragedy column, but there is an overall even balance between light and dark across the the forty-one minute playing time. You need not be a coastal dweller to take something from this record. We folks from the dead centre of the country almost a hundred miles from any seashore experience can apply a sense of imagination and spirit. Of course, the craft and guile of Harbottle and Jonas has provided more than a lending hand. THE SEA IS MY BROTHER is one album not going to need a rescue mission to recover its lost treasure from the depths of Davy Jones' Locker. Just check out this latest record from a duo likely to see their standing rise in the headwind of a fulfilling release. The chord count is more than three and folk music is often liberal with the truth, but let’s not allow such constraints to shackle us too much. 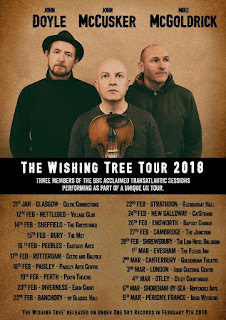 This blog once displayed the phrase ‘start with the cliché before branching out where the music matters’, and the music certainly matters when Mike McGoldrick, John McCusker and John Doyle re-convene for what has now become a fairly frequent tour of collaboration. Post Transatlantic Sessions is the usual time for this Englishman, Scotsman and Irishman to team up, and this is not the intro to that well-worn joke, give or take the odd quip from John McCusker. 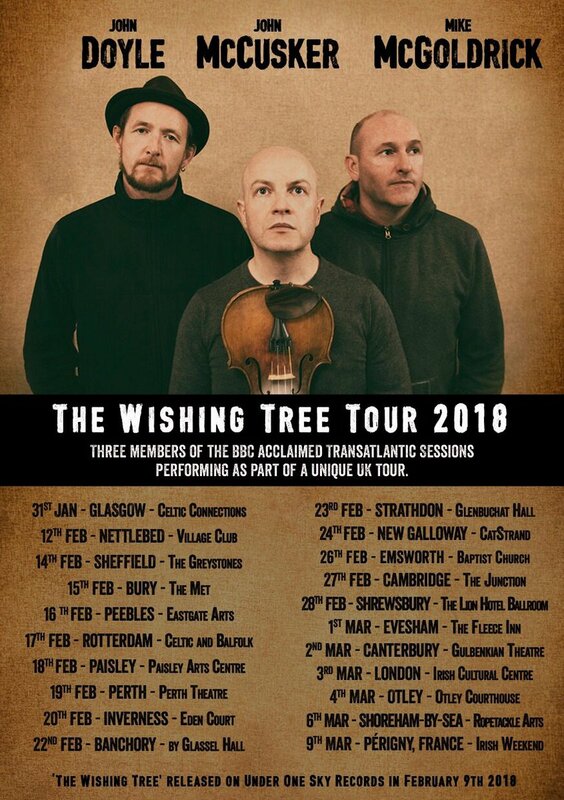 Right in the middle of a 25-date strong UK tour, the Midland Arts Centre (MAC) in Birmingham is once again the Midlands port of call and a sell-out audience is testimony to the trio’s standing in the folk world, alongside frequent trips to the area in the past. The format of these evenings varies very little, mainly due to each performer honing in on their particular area of expertise. Splitting the individual brilliance and the collaborative blend is a fine cut, with both facets conspiring to make this a virtuoso performance of traditional music, albeit sprinkled with a few new tunes to stoke the fire of the past. For those unware of this trio’s long line of work, John McCusker is a premium fiddle player, whilst adding harmonium, whistle and various other strings to his repertoire. Mike McGoldrick is a Uileann pipe specialist plus assorted whistles and flutes, while John Doyle adds the vocals to the mix and a combination of acoustic and electric guitars. The set-up is along the lines of each bringing their own tunes/songs to the table before giving them a multi-instrumental makeover. This format did finally attain recorded status with 2016’s THE WISHING TREE album, but this project retains a prime focus of the live arena, or more aptly theatre. It would take far more than a layman’s ear to absorb the finer detail of the tunes presented, but this evening is best enjoyed by letting the spellbinding sounds wash over you. Emotions, moods, vivid bouts of imagination and a roller coaster of tempo and beats flow from the floor to fill a venue and infiltrate the open senses of a tuned-in audience member. In contrast to the avalanche of instrumentals, the contribution of John Doyle lies in the folk storytelling tradition, and that usually means death, more death and events that lead to a death. All told in a non-morbid and tongue-in-cheek way. Eventually the songs conjure audience contribution, climaxed in a usual way for folks previously attending these events with a rousing version of ‘Billy O’Shea’. After these collaborations, which do crop up at various other times as noted by a Cambridge Folk Festival appearance lined up for this summer, Mike McGoldrick, John McCusker and John Doyle slip back into their many other projects. The one near certainty is that this trio will likely re-convene again and this sell-out audience indicates a Birmingham return would be an opportunity too good to miss. It was six years ago when the music of Jess Klein first crossed my path, although a little research stretches her carer back a lot further. Activity from her has been patchy since attending back-to-back gigs in Birmingham in 2013-14, but this is set to change this year with a brand new album and accompanying UK tour. BACK TO MY GREEN takes her back catalogue into double figures and is a chance to re-energise a European presence for this American singer-songwriter. The anticipated release date on the cusp of a Northern Hemisphere spring is symbolic to the feel of this album, which sees Jess in rejuvenated form following a series of life changing episodes including re-locating from the increasingly stuffy confines of Austin Texas to the more relaxed surroundings of Hillsborough North Carolina. The freshness sweeping across this album begins with a bright and breezy cover and takes root right from the first track. Starting with the opening number can appear a little structural, but it is a toss up to whether the vibes of ‘In Dreams’ best reflect the record rather than the standout track ‘New Thanksgiving Feast’. The latter ingrained instant appeal from the initial plays before the texture of the record took hold, but eventually the soulful, heading nodding-foot tapping tones of the opener made this a justifiable first port of call. This first track acts as the only co-write on the album and sees Jess hook up with North Carolina stalwart Jonathan Byrd, a popular figure on the UK touring circuit. Elsewhere, Jess’s solo pursuit of writing something meaningful and accessible strikes several chords, probably no darker than the political-enviro protest piece ‘Blair Mountain’, best summed up in the line ‘they stole the mountain top’. Throughout an optimum playing time of ten tracks in forty minutes, the production steering ensures the feel rarely drifts from a zone that would have attracted mainstream play in simpler times. Yet a streak of lucid clarity coupled with a soul-lite coating belies a deep inner strength to the writing. 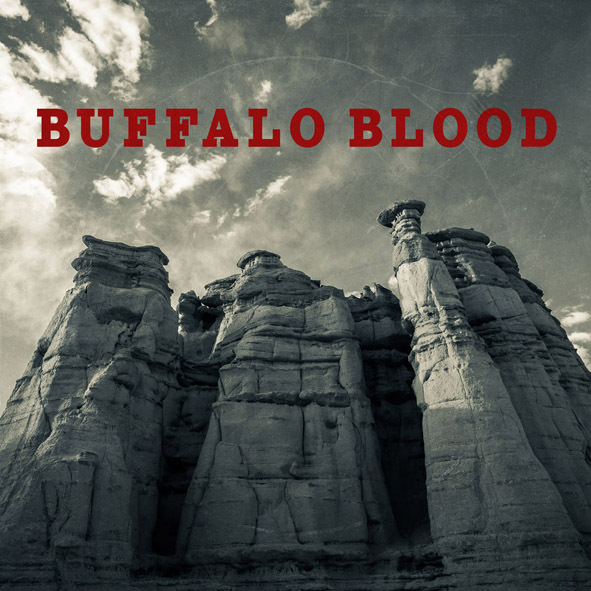 Using the term ‘pop-Americana’ would have a lot more credence with this album under its wing. One key to unlocking this album could lie with the pivotal placing of the title song, the idyllically titled ‘Back to My Green’. While being a strong reflective track at the very heart of the record, it is somewhat overshadowed by the aforementioned ‘New Thanksgiving Feast’, which immediately follows it. Exceeding five minutes in length, underpinned by a gentler acoustic sound away from the plusher parts of the record and laden with lyrics reaching out to important issues, leads this song into epic territory and it blossoms at this junction. Press release info indicates the song as a ‘tribute to Native American pipeline protestors’, but interpretation from lyrical references and content can relate to many issues needing addressing in the current climate. You should now be getting the picture that this album frequently juxtaposes light and dark. Back adopting a chronological approach to assessing this album brings you to the final four tracks. Together as a quartet they present an alternative feel to what surfaces from the first half. ‘Gates of Hell’ leads off this segment of the record and rolls out as a folk story-like song. The sound drifts into a softer tenderer zone for ‘4 the Girlz’, minimalist in both production feel and abbreviated title, though there are moments when the song raises its tempo. ‘Kid’ is a song struggling to make an impact, maybe suffering from the strength of the stronger numbers that precede it rather than bearing inadequacies. ‘I Hear Love’ acts as the archetypal closer, choosing a softer exit rather than a rousing finale, but fits in more with the overall effect of the record. 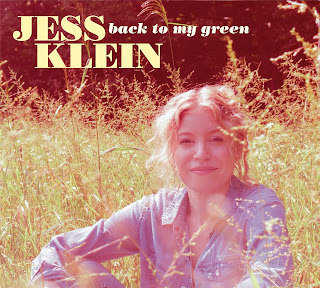 BACK TO MY GREEN is a record to get Jess Klein back into the recording groove and ensure a natural talent does not lie too dormant. It contains numerous highs amongst a steady base to ensure the album never loses its listener’s interest. Ultimately, this album will forge a clear path to many welcoming ears. Highly recommended and having to start somewhere were two key features attached to catching The Artisanals on what was the last show of their first run of UK dates. The recommendation came from respected Nottingham-based promotion Cosmic American, who booked them for an East Midlands show, and are a team that really know their music when it comes to US acts of a certain persuasion. Having to start somewhere relates to a London date held in an empty generic soulless branded room, this one in a North London shopping centre! Not my usual gig manor, but when in a particular area do not let the surroundings blind a band destined to be one of the very best of their ilk, and better known when the word gets around. The offer of a two-for-one ticket from the national promotion for pre-booking in January did not float the boat of many folks in Islington, but the loss was on those not investing the princely sum of £4.50 for a band well worth a lot more. The handful that did dig deep (or importantly investing their time when so much else is on offer) had the treat of a first class performance from a five-piece band heading towards recognised status. Draw a line from the influential days of Petty and Young, through the alt-country pioneers of the 80s to contemporary peers such as Dylan LeBlanc, Sons of Bill, Dawes, 400 Unit and Cordovas and you start to sketch what The Artisanals are all about. Led by the enigmatic pairing of lead man Johnny Delaware and fellow guitarist Clay Houle, and frequently driven from additional keys, bass and drums, they instinctively knew when to switch tempo. This was high-octane rock of the Americana variety purveying images of open roads, endless tours and leading the rock ‘n’ roll charge amidst a time when challenges leave a debris of casualties. Recently formed out of South Carolina, though originally from many points across a vast land, momentum is building on the back of an excellent debut album and a live show that runs to a defining beat. This O2 Academy 2 set was only an hour long but enough time to get a live flavour of what the band can do and what they are planning. The follow up to last year’s self-titled album is in the pipeline with a couple of new numbers shared and plans are afoot for a UK return in the Autumn where greater turnouts than this await with better planning and more directed promotion. ‘Country Roads Town’ depicting Delaware’s South Dakota homeland looked set to be the most notable song on the evening, until the quintet unleashed an unyielding finale of ‘Angel 42’, a seriously good song on record given an extra dimension on stage. Sadly, the few present had missed the opportunity to pick up a physical copy of the album that had sold out on the more populous dates. Still it is available on the streaming sites and well worth tapping into until they arrive on our shores again. Occasionally you have to divorce the surroundings from the stage and just focus on what is felt from the music. The Artisanals made this investment of time worthwhile alongside a declaration that a band rocking in the right direction is ready to fight for a little corner of the UK scene that shares their ideals. The first show of a tour when an artist has literally just stepped off a red eye flight can be a hold your breath moment for an audience. Yet so many times performers dust down and get on with a job that experience acclimatises them to do. 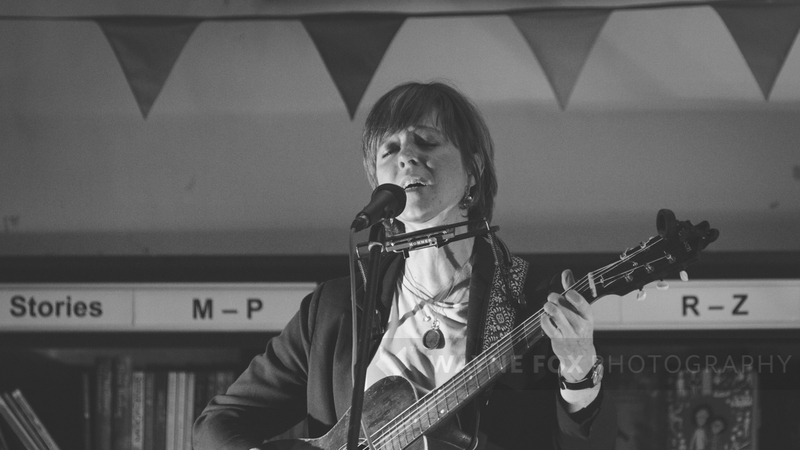 This was the case for Sarah Jane Scouten, who flew straight into London from appearing at Folk Alliance in Montreal the day before and wasted little time in heading back on stage with her touring partner James McEleney. The Slaughtered Lamb was the first of two venues in the capital to host this Canadian artist, who continues to build a presence over here a couple of years after first introduced. This was a rare excursion down to London for gigs, but an interesting insight in how this vast city supports touring artists at grass roots level, especially on a Monday evening in February. A quick glance around the basement performing area for this artisan pub counted around 20 to 30 customers, certainly not outside the parameters of venues of a similar standing in the provinces, to which I am more acquainted with. One common feature binding a lot of touring artists in this sphere is the stunning degree of quality they possess in their chosen field, and frequenting a more just world would realign the numbers. Anyway, it is hard to change minds, so just supporting these artists and providing them with ladles of appreciation can travel a fair distance. It was a case of comparable duos for this gig as Guildford based pairing Jonas and Jane had the honour granted by the Nest Collective promotion to open for the Canadian guests. They took full advantage of the afforded 45-minute slot to deliver a raft of good songs laced with a folk ‘n’ country dressing heavily slanted towards at least the continent of the main act. Harmony vocals, guitar courtesy of Jonas and occasional harmonica from Jane were the sufficient ingredients to conjure up these delicious tunes, which probably peaked in the triple offering of ‘Don’t Cry for Me’, ‘Jumping Ship’ and ‘Sedona Rain’. The first of these posed as the ultimate highlight, with the last one’s depiction of spectacular weather in Arizona grabbing the attention. There are a couple of EP releases floating around the system boasting the name Jonas and Jane that are worth checking out in the formats available, but the potential readily exists for the duo to break out further into something more extended. While the market for this type of set up can be a touch crowded on the roots circuit, there is certainly room for the more talented ones to prosper. Sarah Jane Scouten was previously seen live back in 2015 when she popped into the Marr’s Bar in Worcester for a show a lot lower key than this one. Appearing alone on that evening did not diminish the effect she exuded, and subsequently she has progressed to deliver a superb album titled WHEN THE BLOOM FALLS FROM THE ROSE, which attracted rave reviews in 2017. 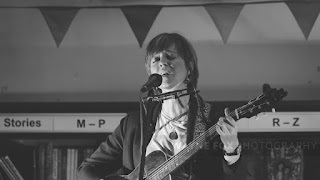 It would be on the right track to say that performing with James McEleney was an upgrade, and even if few songs from that album ultimately made the set list there is enough quality in Sarah Jane Scouten’s armoury not to be bound by a single record. In fact, the most impressionable songs on the evening were not from the album but older tunes in ‘Our Small Town’ from THE CAPE record and one titled ‘I Had to be Right’ written interestingly for her mother. Other pieces to catch the ear were the requested ‘Show Pony’ and a version of the Tennyson poem ‘Crossing the Bar’, given a twin guitar accompaniment. The latest album was not entirely forgotten with ‘Poland’ opening the set, ‘Every Song I Sing’ showing off Sarah’s country credentials and ‘Bang Bang’ audibly reminding what a strong diverse record this was with this touch of retro rockabilly. Sarah Jane Scouten is the latest in a long line of Canadian touring artists who do not fall into pigeon holed categories such as folk, country, Americana (or its cousin Canadiana), but seem to possess the knack of brilliantly blending all facets of the roots spectrum. With a twist of justice, the subsequent dates on this latest jaunt around our Isles should see her stock continue to rise. We really are spoilt with super shows from fabulous artists at this level where creativity and loyalty can lead into various realms of success. Keeping up with Daniel Meade’s itchy feet can be an ordeal, although not a bad one to endure. It looks as if 2019 is going to be another busy one on the release front as this energetic Scot has three releases in the pipeline. Maybe he did not want to be out done by Ryan Adams (unfortunate comparison maybe since first drafted!) or perhaps it is just time to send a timely reminder to folks out there what a versatile performer he is. The first of these takes a step back in time, both literally and metaphorically. LIVE MULES is released under the moniker of Daniel Meade and the Flying Mules, with intent to capture some of the magical moments that conspired when the combo was in prime form. Therefore, this album sets to pinpoint a period where Daniel cracked the honky code and dipped deep into his inner Hank, and a few other boogie pioneers from the halcyon days of raw rock ‘n’ roll in its unabated infancy. Since this period where Daniel rubbed shoulders with the likes of Old Crow Medicine Show and Sturgill Simpson , deviations have led things into the realm of stripped back singer-songwriter, more polished contemporary rock stuff and a high profile role as keyboard player in Ocean Colour Scene’s touring band. Therefore, LIVE MULES acts as a little gift to those hooking up with the original Daniel Meade. Apart from indulging Daniel Meade converts, the potential to recruit newbies is another trait attached to LIVE MULES, and one that could be the more serious outcome, rather than partaking in a little fun. The ten songs adorning the album are familiar to existing fans as they largely appeared on earlier releases in a form that is not too far adrift to what you will hear on the record. Daniel Meade adopted a light production touch when initially recording these songs in the studio so the transition to the stage is not a great distance travelled. The aim of the live recording, which was initially made at a gig in Shetland in 2016, is to capture the magic of an impulsive audience fuelled environment. This is secured within the relative brevity of a thirty-three minute playing time to appease those of us not too enamoured with transferring what happens on stage to record. Despite reservations of this format (experiencing it in person will always prevail in my book), spinning LIVE MULES repeatedly fired a feel good phase to what an effective operator Daniel Meade is when delving into a little retro revival. The press release stated that guitarist Lloyd Reid was on fire, but words describing this were surplus to requirement following first listen. Solo work and a duo album with Lloyd are the planned 2019 follow up to LIVE MULES meaning anybody interested in the work of Daniel Meade is going to need to clear a little space in the coming months. Of course, this is no chore and we await the next move. An album starting with a wacky childhood desire about replicating a move star and ending listening to Test Match Special in a bath of Spanish wine is likely to create an element of curiosity. 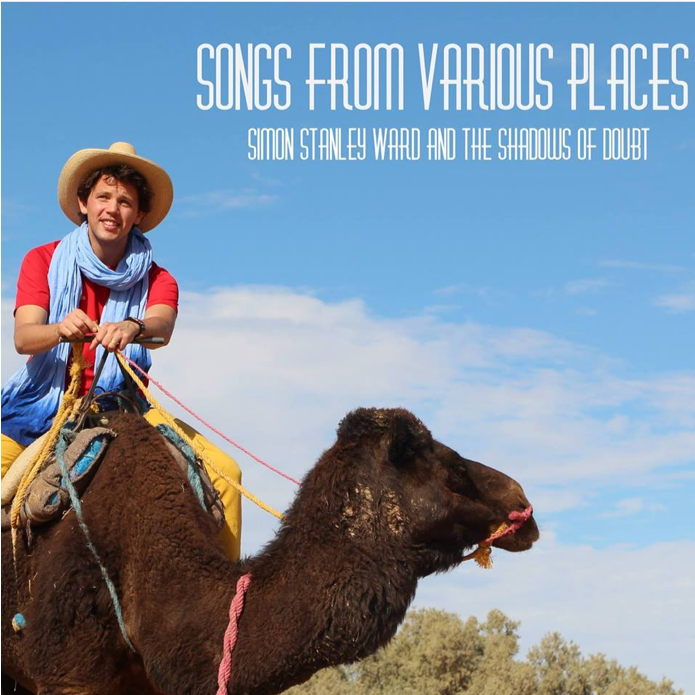 Throw in the fact that Simon Stanley Ward has concentrated his artistic output largely on stand-up comedy since the release of his previous album, and thoughts turn towards a light-hearted streak forming the backbone of this follow up record. A thought compounded by the album cover and backing band called The Shadows of Doubt. Yet there is something more substantial binding the wares of SONGS FROM VARIOUS PLACES. Teaming up with the cream of London’s alt-country rock scene lifts the sound into a heady territory as the largely country influenced tones that brought us the 2015 eponymously titled album have to jostle side-by-side with bundles of sculptured garage pub rock. Any record spearheaded on guitar by Paul Lush (who also handles the production duties) is bound to contain loads of fired up twangy rock, and the inclusion of this in addition to loads more smart instrumentation blends imperially with the distinct quirky vocals of Simon Stanley Ward. Factor in incisive writing across ten tracks and the overall feel to his record escalates into a mood of generating multi spins. If three plays of a record deliver a gist, double figures (if intent moves it in that direction) embeds the subtleties and nuances that improve an album as you strip away the layers. It is easy to hold onto opening track ‘Jurassic Park’ where the post-punk undertones help deliver a fast-paced ode to wishing one-self was Jeff Goldblum in the film of the title track. This is a track that instantly breeds familiarity; a feeling that repeats itself when realising that ‘Water (You Got to Have it)’ was a song brought to events like Maverick and Tingestock, during the last time that Simon played dates with Paul Lush to significant audiences outside his London hinterland. Apart from the lively opener, the other two tracks to hit the mark in the early stages were the retro feel to ‘I Heard it All’ and the riveting ‘Wow!’ complete with a scintillating two minute guitar-fuelled outro. Several plays in and the environmental message of ‘Beluga Whale’ took hold, while the back end duo of ‘Goodbye’ and ‘Stand Up’ had to painstakingly wait before ensuring this album attained entity status in deriving maximum appeal. Ending the album with the wonderfully weird connotations of Spanish Rioja, Test Match Special and Five Live in ‘Wine’ can only fuel a bizarre imagination, but a bloody marvellous one to boot. The decision of Simon Stanley Ward to return to recording musician status has reaped wild rewards and thus re-enforce the admirable attributes he possess in this line of entertainment. Enlisting the services of an experienced and talented team gives this album a real edge to move out of an introverted zone and show that reaching out to a range of likeminded though different styles can work. 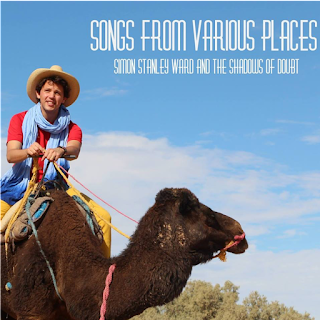 SONGS FROM VARIOUS PLACES may bounce around a flexible canvas, but it delivers a verdict that Simon Stanley Ward may have to balance his artistic activities in music and comedy for the considerable future. Occasionally there are records that come along with your name stamped all over it. Reasons can vary from striking individuality to striking resemblance, but something clicks. First impression need not be the sole arbiter when concluding that an album means something to you. However, it can play a major part, especially in a world when you are forever in listening distance of competing new sounds. The desire to hit the keyboard when first taking in the new album from Kalyn Fay only bubbled away as it compelled a few more plays before hitting loop status. The fact that GOOD COMPANY moved into a familiar zone proved only a positive, as it quickly became one of the standout releases in the first six weeks of the New Year. There is something in the water (or dust) in Oklahoma that breeds singer-songwriters with an edge to how they transit their words to a musical piece. Right across the eleven tracks and forty-seven minute playing time, the moment seizes and hooking into the dusty earthy vibes ripens the album for serious enjoyment. From somebody who bought into the magnetic sounds of Carter Sampson, the spill over into Kalyn Fay can only be down to the Okie psyche. A little digging into the background made the picture a little clearer with Jesse Aycock, who toured last year with Carter Sampson, producing the record to join some of the dots. It also transpires that Kalyn deeply embeds into the vibrant music scene of her home state and thus clarity emerges. Adding to the spice is further input from the highly talented John Fulbright (what happened to his solo stuff?) and another Okie in Lauren Barth who made up the touring trio with Carter and Jesse last year. Yes, Carter does appear as well. Picking out special tracks from this the second album from Kalyn, and another release on Horton Records, is full of options, though the underlying feeling is just to let it play through. 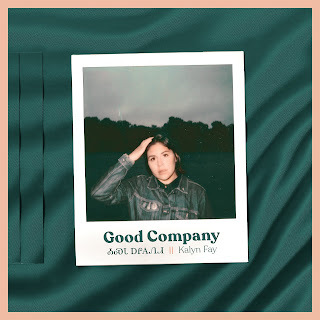 Obviously, the title track ‘Good Company’ is one song to champion, understandably in light of the first impression made. Yet this is probably eclipsed three tracks in with the sublimely adorable ‘Highway Driving’ – so Carter Sampson in comparison. You can instantly make your mind up on the delightful ‘Come Around’ by clicking on the attached video, although this is one buy where you won’t be asking for your money back. The quality link through tracks like ‘Oklahoma Hills’, ‘Faint Memory’ and ‘Dressed in White’ runs seamlessly and without a dip. Interestingly, the latter is the only track Kalyn Fay did not write on the album, instead this one comes from the pen of Malcolm Holcombe, a firm favourite for folks in the UK. Consistency also exists in the studio arrangement of sounds utilising a mélange of guitar, keys, accordion and percussion, plus assorted strings. Together they blend well with the main vocals and the plethora of harmonies that lend a hand to many of the songs. One suspects that GOOD COMPANY is going to stay around for a long time, thus allowing for the discovery of further nuances. 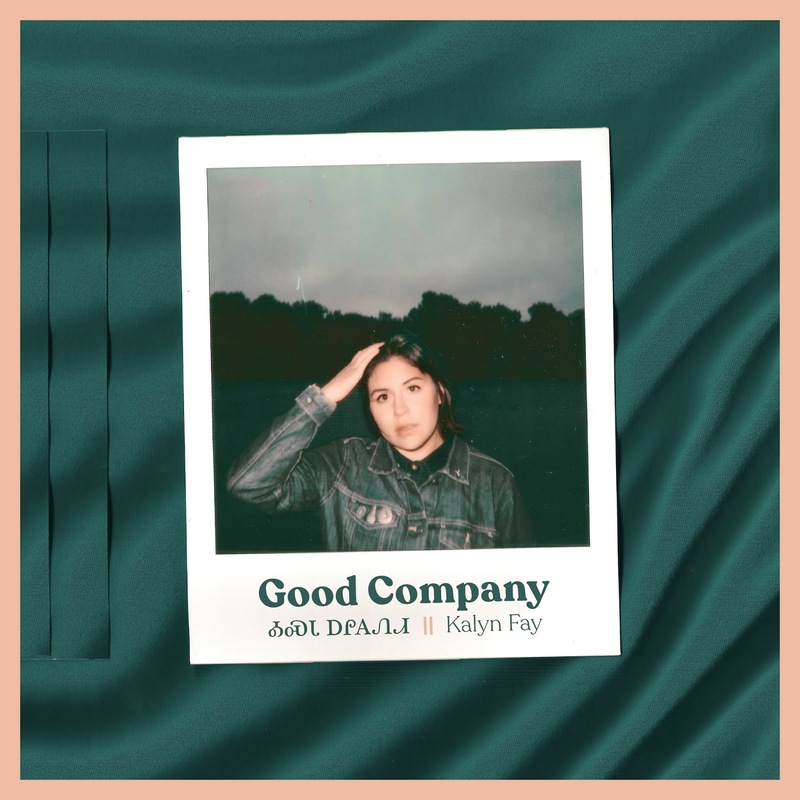 Ultimately, this album takes you wherever you want to go and it is to the credit of Kalyn Fay that she had made such a strong recording set to connect with so many new fans. Keep exporting the good stuff Oklahoma. On an evening where options were aplenty, sometimes it is worth taking a step into lesser known territory to get your live music fix. Despite Laura Veirs being a relatively successful recording artist for a number of years, our musical paths barely crossed. There was some impetus via her 2017 collaboration with Kd Lang and Neko Case in the Case/Lang/Veirs project, and further advancement in finally getting round to listening to last year’s THE LOOKOUT album, which was lavishly savoured upon discovery. So on an evening when Jarrod Dickenson played Moseley and the Transatlantic Sessions rode into town for their annual staging at the Symphony Hall, it was a singer-songwriter from Portland Oregon who won the day with the ticket purchase. 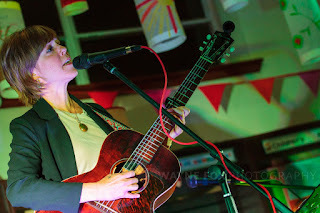 The Laura Veirs show was the mid-priced event of the trio and held at St. Paul’s Church in the Jewellery Quarter area of Birmingham city centre. The operation behind Moseley Folk Festival promoted the gig and twinned this evening’s presentation with one featuring John Smith the day before. A decent turnout supported the show, some maybe curious to experience how these church gigs pan out. For this UK tour, Laura is supported by her friend Sam Amidon; a musician originally from Vermont, but now based in London. Sam opened the show with a short set that progressed significantly during its duration. Like many gigs, though especially in the makeshift surroundings of a church, a little tweaking to the sound is required, likely by both the sound team and the ears of the listener. Once adjustments were made, some of the latter songs sounded quite decent especially when the banjo was strummed and the feeling slipped into old time traditional mode from the rural areas of the south. We had our first glimpse of Laura when Sam invited her to join him on a couple of songs at the end of his set. In true comradery, the invitation was reciprocated and Sam played fiddle on a couple of tunes at the end of the main set. An immediate observation from seeing Laura Veirs live is the obvious pedigree that oozes from her performing space. This exists in the triumvirate of vocals, guitar playing and song selection, with the frequent effect of transfixing an audience into a concentrated zonal state. The subdued lighting may not have been great for pictures, but bathed in rays of candlelight added to the ambience to match the acoustics that were very much to Laura’s liking. The temptation to step off mic for a song may have been tempting, but sadly, it did not materialise. This is a common feature of many church gigs attended, although at the mercy of the artist’s comfort feelings. While not being too familiar with many of Laura Veirs’ songs, there were still some standouts, whether recognising them from the latest album or the introduction provided on the evening. ‘Margaret Sands’ in the opening spot and ‘Mountains of the Moon’ in the encore were the pick from THE LOOKOUT, although ironically both originating far from Laura’s pen. Sadly, my personal favourite ‘Seven Falls” did not make the set list for this show, but its appeal is undiminished. Another assertion from attending this show was how the stripped back sound from Laura solely on acoustic guitar was different when compared to the added electric and pedal steel that featured on the album. Both versions have merit, but I would just slightly err on the record content. Outside the new record, ‘Song for Judee’ (off the Case/Lang/Veirs album), ‘Sun Song’, ‘Carol Kaye’ and a cover of the Daniel Johnston song ‘True Love Will Find You in the End’ proved the songs that lingered in the post-gig memory longer. However, this first real dip into the music of Laura Veirs was more about the essence than the detail. One noted point from this show was the 63 minute set time that Laura played. Admittedly, the break had been seemingly extended, and there is no idea whether a curfew applied, but in my book, this just crawled into the credit column when relating set time to gig cost. It is still an intriguing concept that the duration of live music often enters into untimed territory as far as the main attraction is concerned. While this rarely causes a problem, it is out of sync with many other forms of live artistic entertainment. Set times aside, this delve into the musical world of Laura Veirs has been a worthwhile venture. THE LOOKOUT remains a fine album to discover better late than never, and any future shows in the area are likely to be sought out. The beauty of music is that not a single one of us has exhausted the endless potential out there. The rivers’ Severn and Mississippi have few comparisons apart from the being the longest stretch of flowing fresh water in their respective UK and US. However, common ground flowed tonight as the sounds of the latter rolled down the banks of the former. Five guys jetting in from the southern states (perhaps via a tour van) warmed up a chilly night in Bewdley Worcestershire to inject a little rock ‘n’ roll into a venue probably not noted for bouts of extra amplification. Not to worry, a welcoming house was up for a little boogying and Arkansas Dave responded by getting a packed St. George’s Hall to their feet for a rousing finale. If this is the sign of things to come in 2019, patrons of the Music in the Hall promotion are in for an Americana musical treat. Arkansas Dave (or to be more precise: the Arkansas Dave Band this evening) is now based in Austin Texas, although an artist explicitly keeping faith with his roots. Maybe the trip away from the Delta region to a more cosmopolitan music environment was an essential career journey, but the rich heritage of his home state especially the blues legends brought up in a similar area was never going to leave the fray. The instrumental quintet of lead, rhythm, bass, drums and keys creaked into gear on the stroke of nine thirty and only an eleven o’clock curfew curtailed the band, thus ensuring the roof of St. George’s Hall remained intact. Last year the band toured the UK as a four-piece so the addition of the keys proved a master touch. They played a couple of Midlands gigs on that trip including a less intense lunch time session in West Bromwich as part of a region wide festival. This time the level edged up several notches, more folks lapped it up and the ground set for a return on future trips. It was full on electric for most of the set, the exception being Dave reaching for his acoustic guitar to deliver a cover of Blaze Foley’s ‘Oval Room’. Thus ensuring the obligatory American apology for their president was shared, oh times are so different to Shepherd’s Bush Empire 2003. Elsewhere on the cover front, tunes shared included ones from Muddy Waters and Tom Petty, along with no doubt others that merged into a lengthy finale free of chat. Those aware of the self-titled Arkansas Dave album from last year would have recognised plenty of tracks such as ‘Bad at Being Good’, ‘Chocolate Jesus’, ‘The Wheel’, ‘Diamonds’ and the standout tune ‘On My Way’. The last one was the real cue to get the party underway and is as melodic as you get when steering into the world of southern rock. Americana is the flakey perch surveying this type of music in 2019, but essentially just good ole’ rock ‘n’ roll was served up; one of a roots variety burrowing deep back fifty, sixty, seventy years and more in influence. Arkansas Dave captured this perfectly in a style to blend a good time feel on both stage and in the audience. Others aim for such heights, but sometimes the authenticity of hailing from an area can just raise the bar a touch. To get the Music in the Hall presentation up and running for the year, a couple of local youth acts played a short set to add a little more value to the entrance fee. 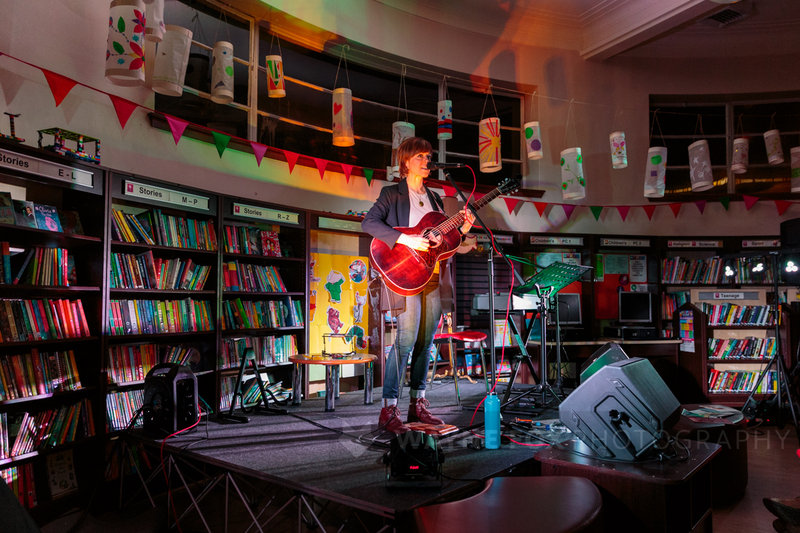 Tom Southam opened things up with around twenty minutes of acoustic music, before a trio consisting of Joshua Terry, Maddie Abbotts and Isabella Gregory took to the stage for about half an hour of mainly original songs. The twin female voices blended well with some impressive acoustic guitar work to make the slot an enjoyable listen. Isabella delivered one tune solo with her guitar and came across as a performer with bags of potential, definitely one to watch. If this evening’s gig was a pitch to get a return invite, Arkansas Dave achieved full marks. Rather than just passing through, the experience appeared to be wholly absorbed. The response was first class and there is growing evidence that this band (led by Dave and his long-term trusty guitarist sidekick Drew) can cut a niche a long way from home. Maybe the Severn and the Mississippi have more in common that we realise.